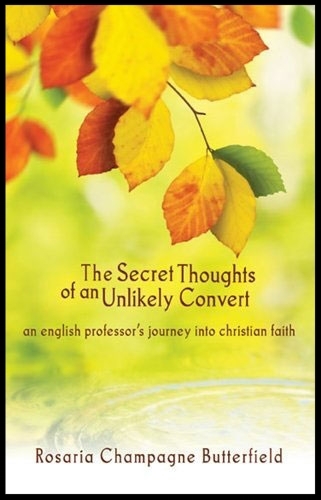 Rosaria Butterfield’s Secret Thoughts of an Unlikely Convert: An English Professor’s Journey into Christian Faithdemands serious attention by all evangelicals interested in the areas of Christian lifestyle, worship, worldview and evangelism. Her narrative describes her self-described ‘trainwreck’ conversion. It documents how Christ confronted and captured someone who never considered herself a ‘seeker’ until Christ first came calling…. While Butterfield’s conversion is a triumph for Christ and testimony to the faithfulness of His servants, it is thankfully not a triumphalist puff piece on Christians in general. The conversion that deconstructed her life and worldview taught her a thing or two about how Christians fail homosexuals and postmoderns. One such failure is an unbelief in Christ’s power to transform people and the Bible’s power to captivate people. She likewise warns against an overzealous quest to supplicate and ‘identify’ that denies Christ by boldly saying that people may embrace both Christ and their sin. How our lives bear the fruit of Christ’s spilled blood is important” (ix). In her book, Rosaria Champagne Butterfield gives a testimony that truly glorifies our sovereign, loving, living God. I bought this for our church library, and as soon as I finished the last page, hopped on the computer to order five more…. Every now and then you read something that not only is a good book, but makes you want to have a meal with the author and get to know them better. This was one for me. If you’re looking for an anti-gay tract, this isn’t it. In fact, Butterfield doesn’t flinch in describing the rich relationship she shared inside the gay and lesbian community, and the heartbreak of having to distance herself from it. She broods, knowing that to openly profess Christ will cost her so many cherished relationships, if not her career. Her decision to publicly speak about her transformation while delivering the Graduate Student Orientation Convocation at Syracuse is utterly captivating. (A copy of her address, entitled ‘What King Solomon Teaches Those in the Wisdom Business: Active Learning and Active Scholarship,’ is included in its entirety and, in my opinion, worth the price of the book.) Along the way, Butterfield walks the tightrope between the Christian community and the LGBT community, immersing herself in Scripture while receiving counsel from a transsexual, ex-Christian minister. It’s a fascinating, gritty glimpse into an intersection of unlikely worldviews.